Safeguarding has been popping up in my diary and conversations quite a lot of late. I have been invited to represent the youth third sector on the Surrey Children's Safeguarding Board. Over time, I believe that my attendance at these meetings could make a difference to young people in Surrey - I know of a number of stories about how third sector organisations, particularly small voluntary ones, are not managing to exchange the information that they need with statutory bodies in order to provide the highest possible level of safeguarding. An example of this is that voluntary organisations need to know if there are any restraining orders on a young person turning up at a youth club if the victim might also be there. I hope that through attending the safeguarding board, and other initiatives, we can bring the statutory and voluntary sectors closer together on Safeguarding. · What is concerning young people about their safety? · Are you a third sector organisation that has concerns around safeguarding? · Perhaps you work for a statutory body and have ideas for change about your relationship with the third sector? Feel free to reply to this blog or email me. Yesterday we celebrated some wonderful young people in Surrey at the Surrey Young Superstars Awards run in partnership with Haslemere Travel at the Radisson Blu in Guildford. Many of you will know that we have run our Celebration of Youth event for a number of years. This year, rather than have two separate events in the county, we chose to work with Haslemere Travel to celebrate the achievements of young people, under their brand – Surrey Young Superstars. Thanks to Savills Guildford who kindly sponsored the event. The awards were presented by sailor Tracy Edwards MBE, well known for leading the first all-female crew in the Whitbread Round the World Yacht Race and becoming the first woman to receive the Yachtsman of the Year Trophy. Tracy told her story, which is a wonderful example of why we should never give up on even the most troublesome young people... at 15 she was expelled from school and only found sailing when backpacking around Europe age 16. Thanks to Tracy for sharing her story and for presenting the awards. Aged only 12 Josh Bryan swam 22 miles in his local swimming pool – equivalent to swimming the Channel - raising more than £750 for Shooting Star Chase, but he didn’t stop there…he subsequently climbed the 541ft of Broadgate Tower in the city of London to raise a further £500. Josh was awarded Individual Fundraising Superstar (age 5-12). Luke Kitterman was inspired to raise funds when a close friend was diagnosed with Ewings Sarcoma, a rare form of bone cancer. Luke raised over £1000 with his friends Callum Brown and Zack Fuller by running the NUTS Challenge, a 7km obstacle course that is used by the Army for training. Luke was awarded Individual Fundraising Superstar (age 13-19). 14 year old Ronnie Barley won Caring Superstar and also the overall 2015 Superstar winner. Ronnie is the sole carer for his mother, who lives with a debilitating long-term illness. He supports his mother emotionally, physically and practically on a daily basis – cleaning, washing, feeding the pets, and ensuring his mother takes her medication. Despite undergoing several major surgeries throughout her childhood, Bella Symons has always been determined to come back to school each time and carry on with her studies. A valued member of the Combined Cadet Force, in addition she coaches a football team for disabled children in her own spare time, where she makes a real, positive difference to the children on the team. Bella was awarded Courageous Superstar. Sing-along concerts help build a rapport between the students at Royal Holloway College and over one hundred people in several nursing homes. Samuel Wong has expanded the Singalong group from just 4 to more than 200 members. He has led a group to increase volunteering amongst students and done other voluntary roles including supporting public consultations and promoting social harmony with the Surrey Police Independent Advisory Group. Samuel was awarded the Volunteering Superstar. Surrey Heath Youth Council was awarded the Group Volunteering Superstar – it has been involved in all sorts of projects, including consulting and raising money to improve a local skate park, a litter pick up service, health service and bus service surveys and giving young people’s views on local development in Camberley. They also ran an anti-bullying conference and trained 100 young people from the Borough’s five main schools to become anti-bullying ambassadors, to support victims and help reduce bullying. Epsom and Ewell PHAB, a youth club which integrates both able-bodied and children with disabilities wrote, produced and performed a musical called “We predict a riot” at the Epsom Playhouse. The team ran the event on a tight budget - organizing auditions, running extensive rehearsals at weekends, ordering costumes, booking the theatre, arranging publicity and, of course, selling tickets. Over 45 youngsters took part aged 8-18, either as performers or stage crew, helped by a team of 20 volunteers. They were awarded Enterprise Superstar. We are grateful, as ever, for the wonderful support that we received from our patrons and other dignitaries in Surrey. Attendees included the Lord-Lieutenant, the High Sheriff, the chairman of Surrey County Council, the Mayor of Haslemere, the Deputy Mayor of Guildford, the Detective Chief Superintendent and 18 member organisations of Surrey Youth Focus. Checkout our website for pictures. I have had a pretty busy couple of weeks. Here are a few items that I would like to highlight. Surrey County Council is running a project to get Time Banks set up across Surrey. Timebanks are a way of getting people to offer and receive skills in their communities. They often appeal to a different people in society to those who do traditional volunteering. If you want to know more, you can attend an information session in Guildford on 27th May. Otherwise contact Liz Tracey. We presented Communilab to our Community Champions, Penningtons Manches solicitors, who were, as ever, very supportive and helpful. 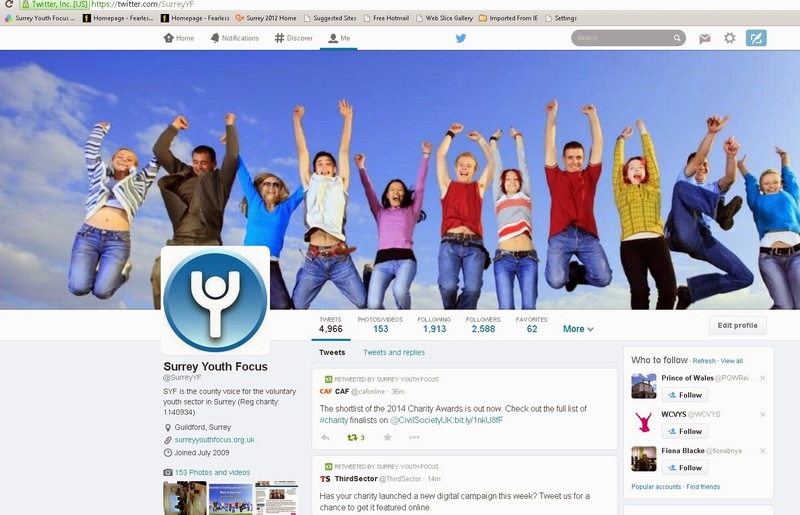 They took a good look at the system and came up with ideas as to how they can use it to help young people in Surrey.